Donald Trump warned Russia that U.S. missiles to Syria “will be coming, nice and new and “smart!” in a tweet Wednesday morning. The threat is a response to a reported chemical weapons attack on the Syrian town of Douma, which was held by the rebel forces. At least 40 people died during the bombing on Saturday (Apr. 7,) according to rescue workers and other observers who blame the Syrian government forces. The Syrian government has denied the accusations. While initially reluctant to get entangled in the war in Syria, the U.S. is prepared to be more involved than ever. 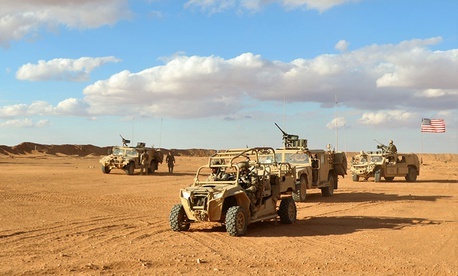 In fiscal year 2019, the government assigned $15.3 billion’s worth of Department of Defense funds for U.S. operations in the troubled Middle Eastern country. It set aside another billion in foreign aid and other help through the Department of State, according Costs of War, a research project at Brown University. The military commitment to Syria, however, remains tiny compared to the U.S.’s involvement in Afghanistan and Pakistan. At its highest point, in 2011, U.S. officials appropriated nearly $120 billion to spend in that conflict. The size of the U.S. budget for those two countries remained more than twice as big as the one for Syria in fiscal 2018. It’s boom time in America! For now.